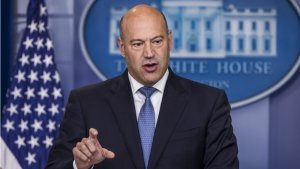 Gary Cohn, former Goldman Sachs President and former Chief Economic Advisor of U.S said he thinks the world will have a global cryptocurrency that is not bitcoin. After Cohn left Goldman Sachs, he joins the White House as the National Economic Council Director for the Trump Administration. One year later, Cohn left the White House when President Trump announced plans to levy tariffs on aluminum and steel imports- a move that Cohn advised against. Since then, Cohn has expressed interest in the emerging markets of cryptocurrency and blockchain applications, even proposing a "business idea" that combines blockchain with banking. Cohn told CNBC's Bob Pisani in an interview. "I'm not a big believer in Bitcoin. I am a believer in blockchain technology." Also, he made it clear the Bitcoin is too complex as a cryptocurrency and unfriendly to the average user's experience when it comes to mining and it's cost. "I do think we will have a global cryptocurrency at some point where the world understands it and it's not based on mining costs or cost of electricity or things like that,"
Bitcoin is created through an energy-intensive "mining" process that has come to require specialized computer hardware. The cryptocurrency is also the first application of blockchain technology, which eliminates the need for a third-party intermediary by rapidly creating a secure, permanent record of transactions between two parties. The technology allows bitcoin users to send funds across borders quickly at a low cost. however, bitcoin has run into challenges such as handling high transaction volume. Cohn expects the digital coin of the future will be simpler than bitcoin. "It will be a more easily understood cryptocurrency, it will probaly have some blockchin technology behind it, but it will be much more easily understood how it's created, how it moves and how people can use it." Whether Bitcoin will be the world's truly "global cryptocurrency' is uncertain, but it is becoming clear that cryptocurrency as a whole is making strides towards mass adoption by the general public corporations, and governments. Bitcoin is currently trading at $8,517.57 USD. as at press released.